An invitation letter is a written message that requests a person, group of people, or a company to be present at a certain event. This type of letter may be sent both by email and post. For some cases, hand-written or printed invitations will work better than an email. While you can just call your friend and invite him or her to your birthday, you will need to write an invitation letter if you need to invite guests for a formal event, business partners for a meeting, or assure the embassy consul that you will be hosting for your friend, and more. The aim of a business invitation letter is to briefly describe the essence of the future event and tell the reader how it’s important for him or her to be present at the event (two weeks before the event or more). Besides, an invitation letter is a form of persuasive writing, especially if you need to receive a 100% positive response to the invitation. You need to send the invitation in advance so your guests will have the possibility to plan the time in their schedule. It’s especially important if your guests have tight schedules and you want to raise the chance of their attendance at the event. Invitation letters for visa purposes (also known as the invitation letter to a friend) have another aim. This letter should become a guarantee that your friend, family member, or other person will take care of you during your presence in the foreign country. Your friend should be a resident of the country you are planning to visit. In this article you will learn how to write a formal invitation to the event and how to write an invitation letter to a friend (to make a visa). So, let’s start! An invitation letter is usually limited by one page, but may be expanded if you need to attach more information about the event. Organize your information in a well-structured text so the reader will easily understand the information from your letter. Make a list of potential visitors. 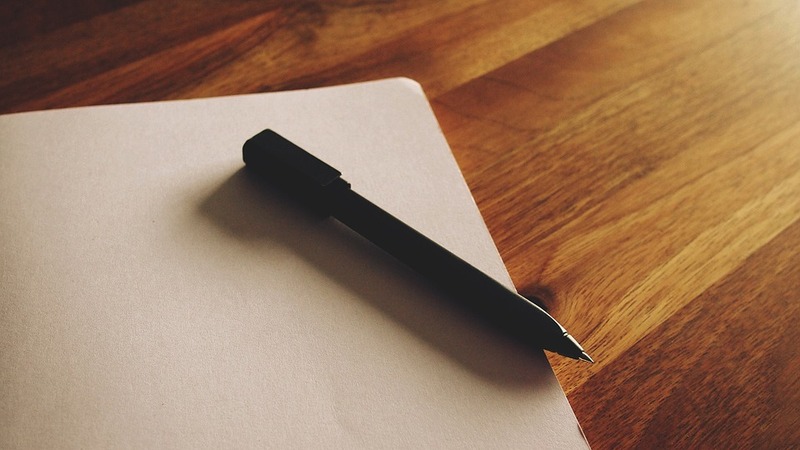 If you will be writing a personal letter, make sure that you accurately mention their names. Also, you need to find out whether the letter is formal or informal and choose the appropriate tone. Find out the necessary information. Make sure that you have all the information about the event. Briefly note the main points that you need to highlight in the letter. Are there any special instructions for the visitor? 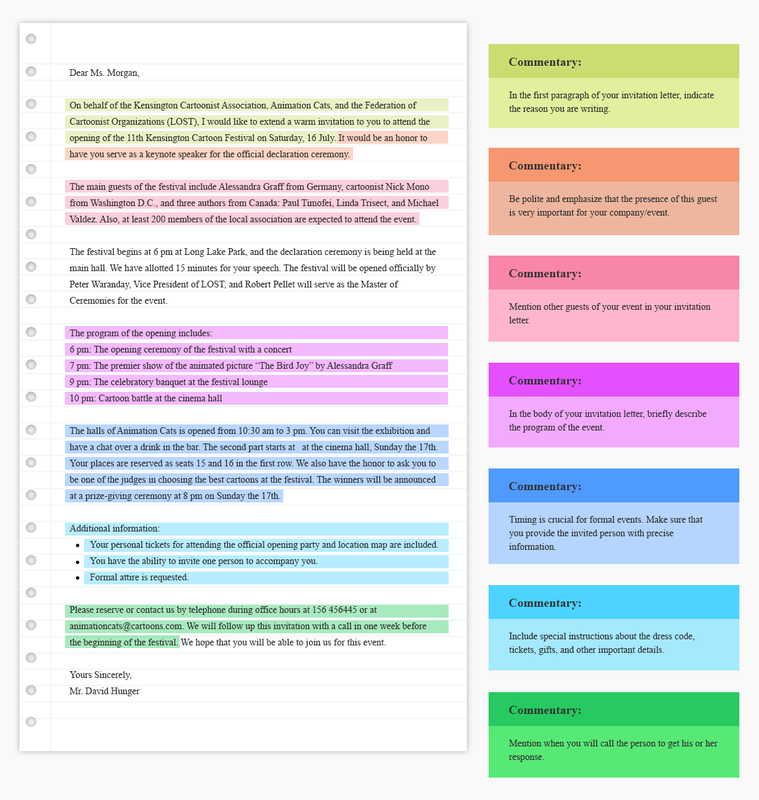 Do you need a response to your letter? How many guests do you plan to have Do you need to ask for a certain dress code? Define the tone of the letter. If you are writing to a friend, write the text in an informal tone. If you are writing as a representative of an organization or to the embassy, you will need to keep a formal tone. If you have decided to send an ordinary letter, think of what paper you need to choose. Find out whether your company has special forms for such occasions. What steps do you need to proceed to write a good invitation letter? What is the best way to ask the reader to visit your event? Basically, there is no single approach to writing a formal or informal invitation letter. Below we have collected the most common steps you need to consider while creating a formal email to an event. Step 1. Write the subject line (for emails). Step 2. Add a letterhead. If you are writing a formal invitation, use the company’s letterhead. It is not required, but it will represent the authority of the organization in a more professional light. Step 3. Write the salutation. Step 4. Write the body of the letter. In the first paragraph, state clearly the purpose of the event. But first, you need to show your respect and happiness for inviting the person to the event. Then you need to mention where the event will take place and the time. This information should be at the very beginning, as it will be helpful for the reader to find necessary information without reading the letter once more. In the second paragraph you can identify yourself as a constituent. Describe the aim of the event and why you think the reader needs to attend it. Additionally you can attach more details about the event. If the event will have a program, it is advisable to list it in the letter. You can also mention the special guests or activities that were prepared for the event. If the event may imply giving a gift and you don’t want to receive any, just mention “No gifts please.” For other cases, don’t mention anything at all. Step 5. Write the closing and signature. Show your gratitude for considering your invitation. Say that you are looking forward to seeing them at the event. If you plan to make a call to get a response, mention the date. Also, if you are asking the recipient to confirm their presence by email or filling in the form, indicate the deadline. Thank you for your consideration. We sincerely hope that you will accept our invitation, and we look forward to your presence. Step 6. Proofread the letter. Always look through the letter before sending it. Correct grammar, punctuation, and spelling errors. Make sure that your text doesn’t contain incomplete sentences or jargon. Provide detailed information about the event. Always check the letter before sending it. Don’t forget to write the contact information. Mention special instructions or requirements if needed. Follow the required format if needed. Send the invitation letter beforehand. In the text below you can see what a well-written invitation email for an event looks like. Consider the comments in the text to have a better understanding of how a good invitation letter should look. Check other invitation letter samples on our website for more information. All samples were written by our experts, and you can successfully use them as templates for your own letters. Click on the text to view the full-sized image. This type of invitation letter is usually written to an embassy for visa. Some countries ask for a visa to enter their country, and an invitation letter is one of the documents needed for the application process. The aim of this letter is to guarantee that your friend will provide you with a place to leave while you stay in the foreign country for a specific period of time. While some countries don’t require a letter, attaching an invitation letter to the embassy won’t hurt. Basically, there are many variants of invitation letters: an invitation from family and friends for tourist visa, a business invitation letter, a sponsor invitation letter, a hospital invitation letter, and a college invitation letter. If you have a lot of friends or relatives in the country you need to visit, choose the person with the best job position and who has been in the country for a long time. Besides, if you can prove your relationships, it will be advisable to attach a document (birth or marriage certificate) or a joint photo to prove your relationships. Also, if the company is inviting you to visit their country for a business meeting, you also need an invitation letter. Usually, this type of letter is written by a manager or company representative. It should contain information about the relationship between you and the person you are visiting. Attach an itinerary of business activities to show that you are planning to work for a certain period of time. Also, you may need to attach your work position, salary, and other details about your current job. If you are sponsored to take part in the conference, give a speech, or make a presentation, you also may need an invitation letter. In such a case you will need to receive an invitation from the person, organizer, or company that sponsors your activity. The person should tell why they have chosen you for this event, define the dates of your stay, and disclose the itinerary. Write the date the letter was written. For example: October 20, 2018. Insert the embassy name. Visit the website of the embassy and make sure that you are spelling it correctly. Embassy contact information: address and phone number. First paragraph. Here you need to list your name, your person’s status, and contact information (phone number, email, and current address). Second paragraph. Mention your friend’s name, and passport requisites. Write about the purpose of his or her visit and point out your relationships. Define the trip dates and places you are going to see or visit. Also, provide evidence of how the trip will be funded. Make a note if you have attached any documents or images to the letter. 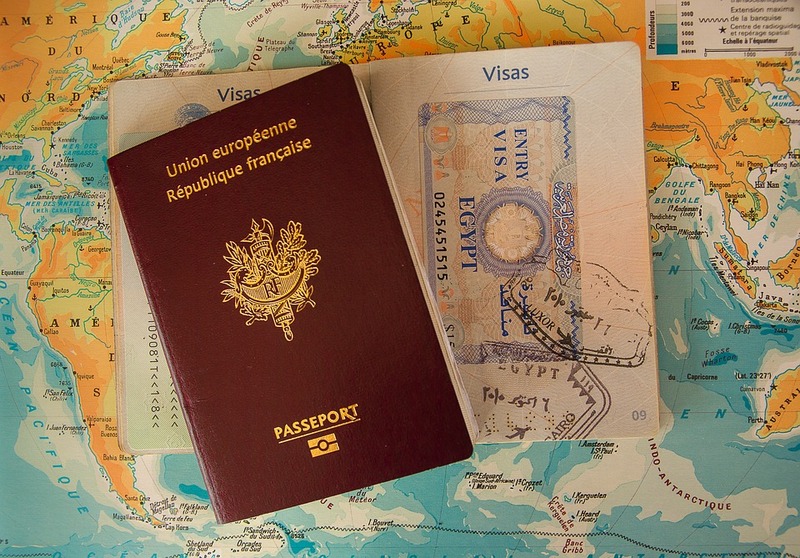 The embassy usually doesn’t require any additional documents, but the host can attach such copies: a scanned copy of ID or passport, evidence of financial viability, rental certificate, etc. Below you can see an example of a letter to a visa officer. We have chosen the general structure of an invitation letter addressed to a visa officer. The author plans to host a business partner from another country. Please be advised that we would like to formally invite Antony Hopkins to visit our company in Bern in February 2018 (February 1, 2018 until February 15, 2018). My name is Anatolia Adamantis, and I am a citizen of Switzerland. I am working in the Swiss National bank in Bern. My passport number is AA11111111. As you can see, there are various types of invitation letters, and the structural elements will depend on the purpose of the letter. We hope that our guide will help you create an outstanding invitation letter for any occasion. Just follow our guide and consider recommendations from our samples, and we believe that you will make a great invitation letter.